Veteran country artist releases long awaited follow-up to the Grammy winning opus These Days. Vince Gill has earned a lot of respect over the course of his illustrious Nashville career. An exemplar of the country gentleman, his sweet tones and tasteful pickings have attracted fans from both sides of the modern/classic country divide. As a session player and solo artist his credentials proceed him in the soon to be released album Guitar Slinger. His first release since 2006's These Days, a four-CD (43-song) box set that garnered much deserved critical acclaim. The thematic and rootsy These Days is an intimidating opus to follow, but one gets the sense that Vince Gill feels no pressure to repeat the artistic success of that formidable batch of tunes. With that said, one wants very much to like this album. Vince Gill has always represented the kind of smooth production you can take to the bank, even though he has not garnered much recent radio play. Guitar Slinger was recorded and produced in his new home studio and enlists the help of his wife (Amy Grant) and others to share songwriting duties. The press releases set the listener up for a darker and more instrumental chapter in Vince Gill history, "As the record title indicates, Vince allowed himself to indulge his deepest guitar desires throughout the making of his newest record, admitting that a couple of the songs on his upcoming effort fade out with two or more minutes of guitar playing. While he admits this might not be the cut of everyone’s jib, he felt confident in his resolve to take this approach." Guitar Slinger is neither overly dark nor an obvious showcase of his guitar chops. The melodies, voice, and smooth production that surround dark subjects in songs like "Threaten Me With Heaven" and "Billy Paul" sound too pretty to stake the claim that Guitar Slinger is a dark album. Rather, it is the songwriting that provides the focus of this release. He has picked songs that he thought could stand on their own. As such, Guitar Slinger does not have the overall musical congruence that can be found on These Days. He has packed a truckload of influences into Guitar Slinger, stating in a recent press release that it is "...not an all-traditional record, it’s not an all-contemporary record; it’s all over the map...” This is accurate. The sounds on Guitar Slinger are admittedly not as cohesive as other releases. Many of the tunes fall somewhere in the inspirational pop category, making it feel more sentimental and less rounded than other Vince Gill releases. It is a warm record, from sound to sentiment, that doesn’t entirely deliver. The guitar tones are smooth and the solos always tasteful -- never showy. But it mostly fails to live up to its own name. Guitar Slinger is at its best when covering the kind of musical territory we hear in the rollicking title track, or the traditional sounds found in "Buttermilk John", which is a fitting tribute to the late steel guitar player John Hughey. 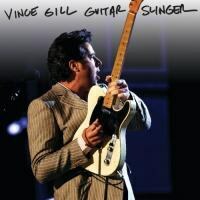 The title track "Guitar Slinger" provides a punchy start to the record and showcases both a sense of humor and the kind of chicken-picking that Vince Gill is famous for. The ode to Billy Holiday, "When The Lady Sings the Blues", enters some serious Bonnie Raitt territory, with a decent groove and a tasteful blues guitar solo. Things get off to a great start, but falter whenever the album aims to please everyone. This results in sleepy mid-tempo songs like "Threaten Me With Heaven" and the Beatles influenced rhythm of "When Lonely Comes Around". These tracks, and and his duet with his wife Amy Grant on "True Love", are still digging themselves out of the early '90s. The melodies are not half bad, but the arrangements are lackluster and are overly-sentimental. "Tell Me Fool" and the duet with Ashley Monroe, "Who Wouldn’t Fall in Love With You", exhibit strengths that the other pop influenced songs do not, with great hooks and an especially smooth guitar solo at the end of "Who Wouldn’t Fall in Love With You".